Apple season has arrived here in the Northeast and the supermarket has been taken over by all different types of apples! Apple Crisp and Apple Pie are the most popular desserts for this fall fruit, but I have a confession to make, I don’t like apple pie! I do however love apple crisp. It is delicious, easy to make, doesn’t have a crust, and most importantly, it goes perfectly with vanilla ice cream. Peel, core and cut the apples into chunks. Place the apples in a bowl and add the lemon juice, sugar, salt, ground cinnamon and ground nutmeg and set aside. Pour the apple mixture in the baking dish. Sprinkle the topping evenly over the apples. Bake until the topping is crisp and golden brown and the apple filling bubbles slowly, about 50 minutes. Serve warm. 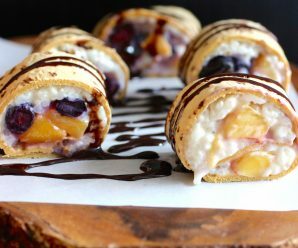 Your blog is my go-to-resource for dinner & dessert! Thank you for sharing. My husband and I recently moved to Bogotá, and I am finding such delectable recipes with Colombian flair on your site. Thank you for your continued hard work and for sharing these with the world! 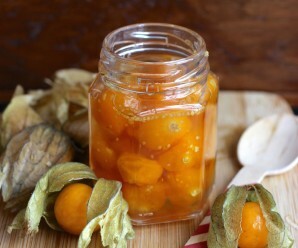 I can’t have nuts but i really want to do this recipe, what my best option without using the nuts? i was think just replacing the nuts with more oatmeal. let me know thanks! i love you blog! Happy fall this will be with beauties like this! Hi Erika! I leave in Boston, MA, but I’m also from Medellin. I love your blog, I just made apple crisp. What a great recipe. I love all your recipes, you are a very talented chef. Thanks for sharing all this amazing creations! 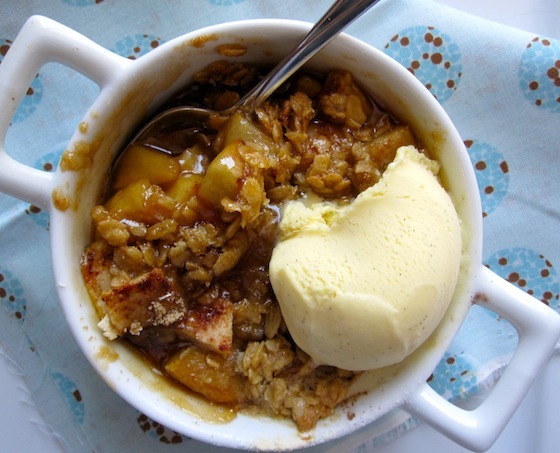 Well I don’t understand this not-loving-apple-pie business…but I do understand loving apple crisp! Especially with a nice scoop of ice cream. Swoon. 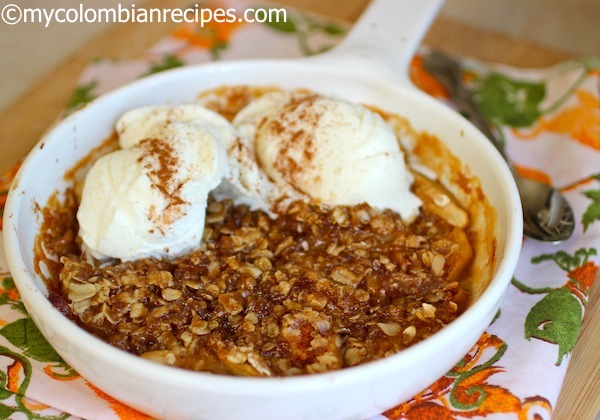 i love apple pie, but i can’t deny the advantages of apple crisp. plus, it’s always extremely tasty, especially with ice cream! 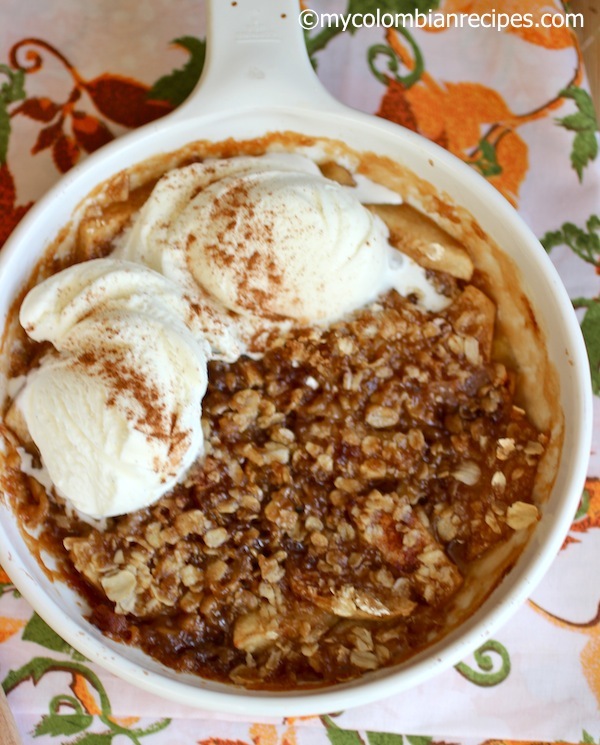 That apple crisp looks “fall-licious” it is so good. Perfect fall dessert. How big of a pan do I need?